I’m currently in the Faroe Islands, a relatively unknown and semi-autonomous part of Denmark located in the North Atlantic. Sort of like Greenland, but too small to appear on most maps. I’m in this chilly archipelago for a speech to the annual meeting of the Faroese People’s Party. According to Wikipedia, “the party is supportive of the economic liberalism.” But liberal in this context is classical liberal, so they’re my kind of people. I spoke on the economics of fiscal policy and talked about issues such as my Golden Rule and the Laffer Curve, but today’s post is about what I learned, not what I said. The current government of the Faroe Islands, which includes the People’s Party, has modernized its Social Security regime with a system of personal retirement accounts. Starting next January, workers will begin setting aside some of their income to finance a comfortable retirement income. When fully implemented, workers will be putting 15 percent of their income in their accounts, creating a system that’s even larger than the private retirement models in Australia and Chile. So why did Faroese politicians take this step? Well, unlike politicians in most nations, they looked at the long-run data, saw that they had an aging population, realized that a tax-and-transfer scheme no longer could work, and decided to reform now instead of waiting for the old system to collapse. 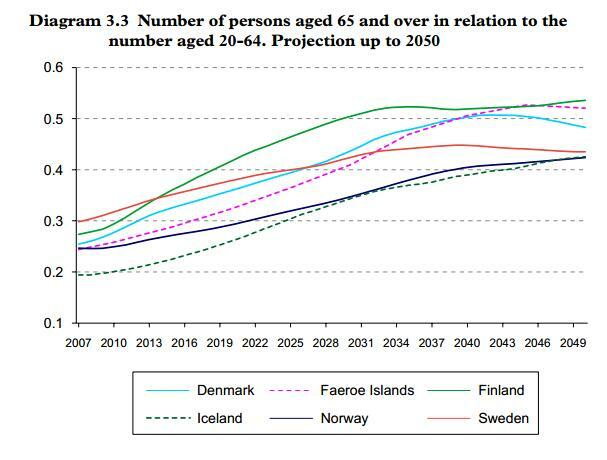 Here’s a chart put together by the Nordic Council. 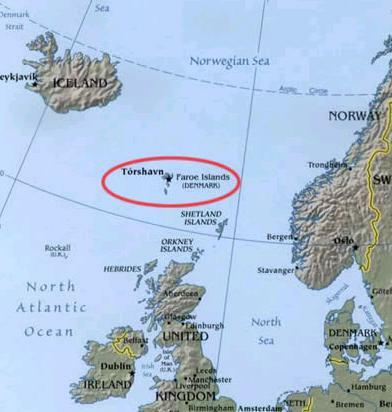 As you can see, the Faroe Islands were (and other jurisdictions are) heading to an intolerable and unsustainable situation of too few workers and too many retirees. By the way, the same situation exists in the United States. Our population is aging, the Baby Boomers are going into retirement, and birth rates have dropped. Our long-run numbers aren’t as grim as some other nations, but our Social Security system is basically insolvent. Indeed, Social Security’s long-run deficit is measured in trillions, not billions. According to the most recent Trustee’s Report, deficits over the next 75 years are expected to equal $36 trillion. And that’s after adjusting for inflation! For what it’s worth, if a private insurance or pension company kept its books in the same was as Social Security, it would be forced into bankruptcy and its managers would be indicted for fraud.. But when politicians operate a Ponzi Scheme, we’re supposed to applaud them for compassion! This is why it might be worth the cost if we sent the politicians in Washington on a junket (using their taxpayer-financed fleet of luxury jets) to Torshavn, the Faroese capital. They could eat some lamb and fish and learn what it’s like to responsibly address a problem before it becomes a crisis. Or we could save the money and simply force them to watch my video on personal retirement accounts. P.S. In you like gallows humor, you can enjoy some Social Security cartoons here, here, and here. And we also have a Social Security joke, though it’s not overly funny when you realize it’s a depiction of reality. P.P.P.S. On Monday, I continue my tour of the North Atlantic with a speech in Iceland on the Laffer Curve. I don’t know if I’ll say anything memorable, but I’ll use the opportunity to learn more about some of that nation’s policies, including their very successful privatized fishery system. Iceland has some bad policies, of course, but it’s also worth noting that they wisely have rejected membership in the European Union, they’ve reduced the burden of government spending in recent years, and they also made the right decision when they decided (with help from an outraged electorate) to limit bailouts when their banks went bust. You won’t be surprised to learn, though, that the Paris-based OECD has been using American tax dollars to advocate bad fiscal policy in Iceland. I think it is a joke of biblical proportion that governments came up with Ponzi schemes that required an ever expanding supply of young workers and just afterward the world found a way to artificially retard the supply of those very people. I continued to be surprised by the fact that letting younger workers invest their Social Security taxes as they please – should they ever want to – can be so controversial. I’m not sure how familiar you might be with rate of return on certain IRA schemes, but does this look like a realistic scenario below? Anyways, glad you made this post at this time! I’ve been discussing personal accounts lately with friends and family over the past few days. I suspect that if more and more younger people started opening up IRA’s before they turn 25, then the same incentives that allow the NRA to have such a strong grassroots-level of support will carry over into support for expanding market alternatives to Social Security, or at least preserving the ones that already exist.